Francis Byrne, a World War II veteran who stormed the beaches of Normandy, received his long overdue Purple Heart on Friday in Manchester, New Hampshire. 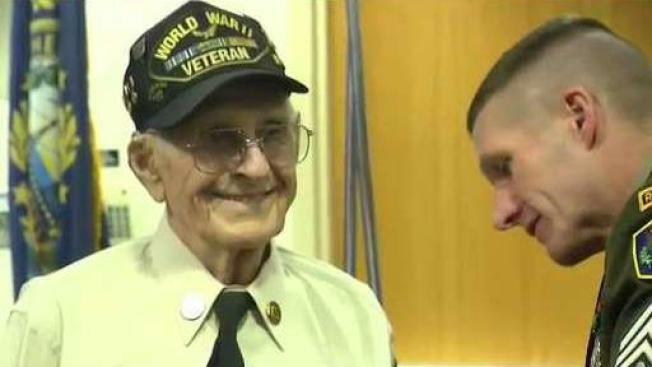 A World War II veteran in New Hampshire who's been waiting more than seven decades for his Purple Heart was finally awarded his medal Friday. The story of 94-year-old Cpl. Francis Byrne, of Manchester, has made headlines around the world. "Fran, you are an exceptional member of the greatest generation," said Sen. Jeanne Shaheen as she kicked off Friday's ceremony at Eliot Hospital. Byrne stood up from his wheelchair as officials with the United States Army pinned a Purple Heart to his uniform while the crowd erupted in cheers. "I can't believe it, it's so overwhelming," Byrne said. "It's something you can't really imagine. I never thought it would really come through." Byrne enlisted when he was 18 years old. He landed on Omaha Beach at Normandy and fought in the Battle of the Bulge. In 1944, he was injured in the line of duty in Belgium when he was hit by shrapnel from a German landmine. "The lieutenant who was going to write him up for his Purple Heart was killed the next day and so it's taken this long to get that recognition that he so deserves," said Shaheen who helped get Byrne his medal. Byrne is battling terminal cancer and when doctors recently gave him just months to live, he worried he'd never be able to fill the empty spot in his medal display case. "He's a true example for the rest of us in the military to follow," said David Mikolaities, the Adjunct General of the New Hampshire National Guard. Byrne is described as a true American hero who has shown patience and gratitude. And even in his moment to shine – a humble man who honors his brothers who never came home. "Like I have always said, we left the heroes over there," Byrne said during his ceremony. When Byrne was asked what he plans to do next, he responded by saying, he'd put his Purple Heart in his display case on his wall and "relax."